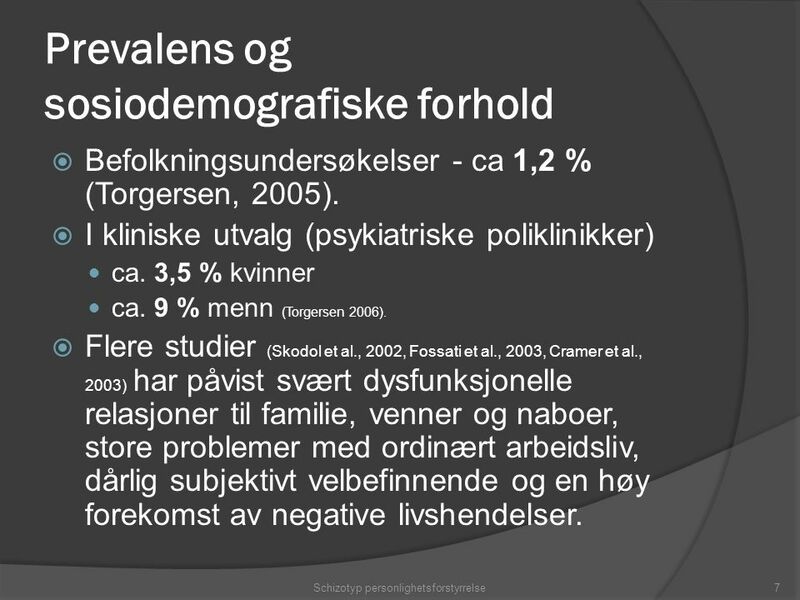 Øyvind Urnes Avdeling for personlighetspsykiatri. 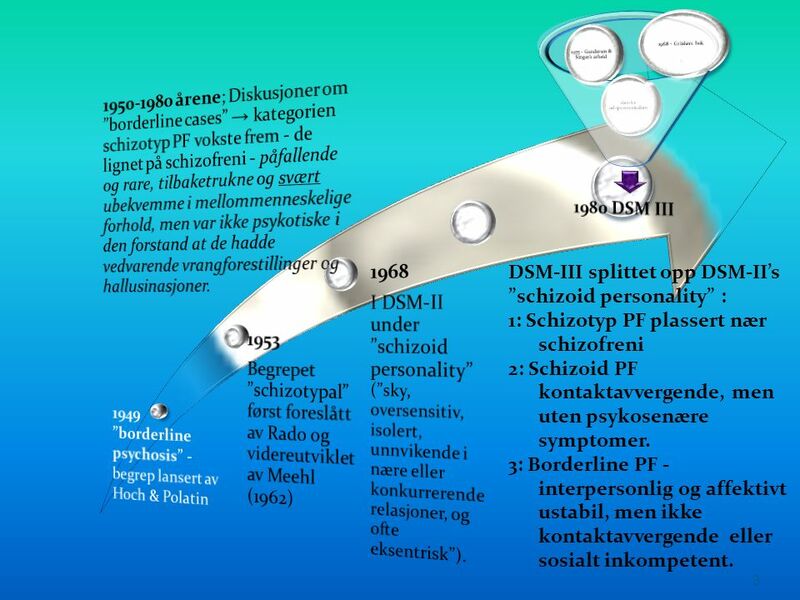 3 3 DSM-III splittet opp DSM-II’s ”schizoid personality” : 1: Schizotyp PF plassert nær schizofreni 2: Schizoid PF kontaktavvergende, men uten psykosenære symptomer. 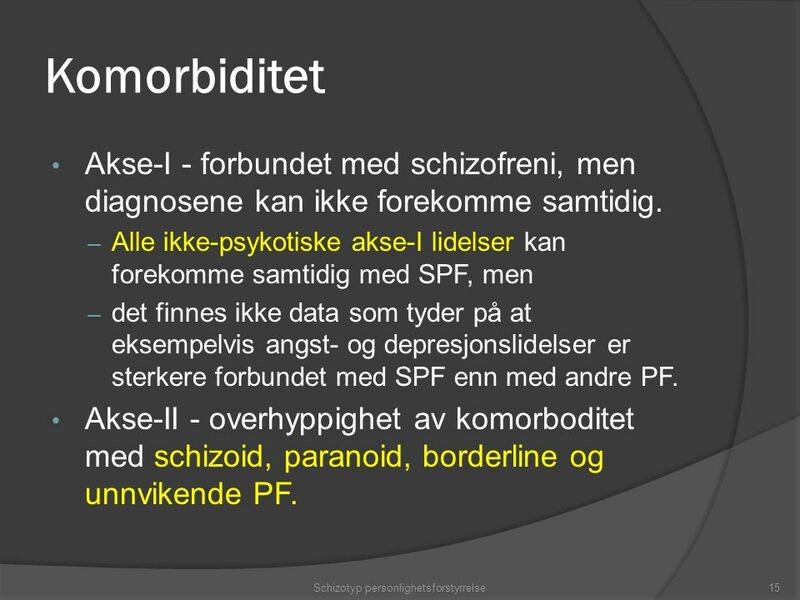 3: Borderline PF - interpersonlig og affektivt ustabil, men ikke kontaktavvergende eller sosialt inkompetent. 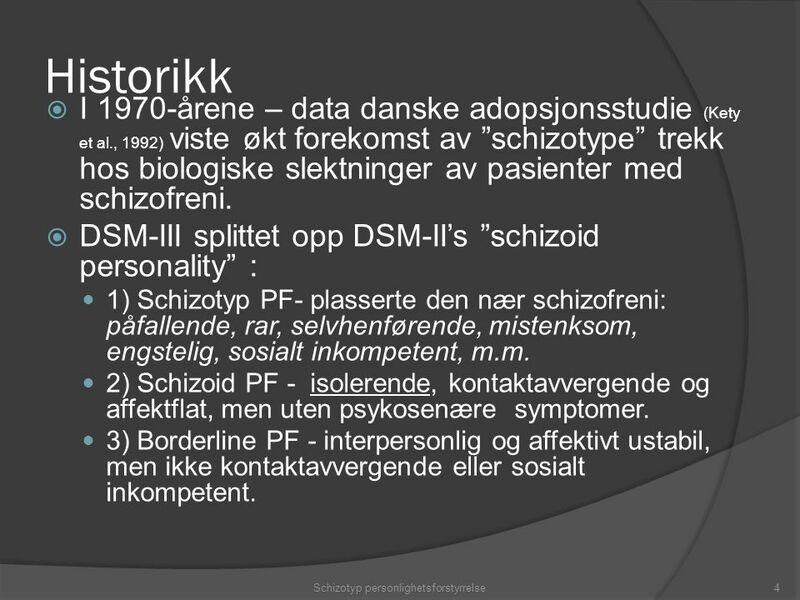 12 DSM-5: Fire eller flere av 6 patologiske personlighetstrekk Psykotisisme: 1. 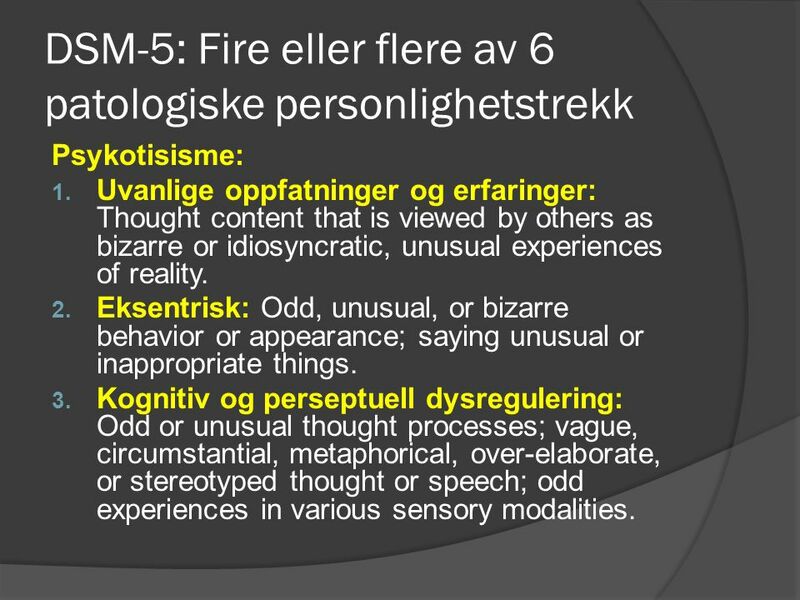 Uvanlige oppfatninger og erfaringer: Thought content that is viewed by others as bizarre or idiosyncratic, unusual experiences of reality. 2. 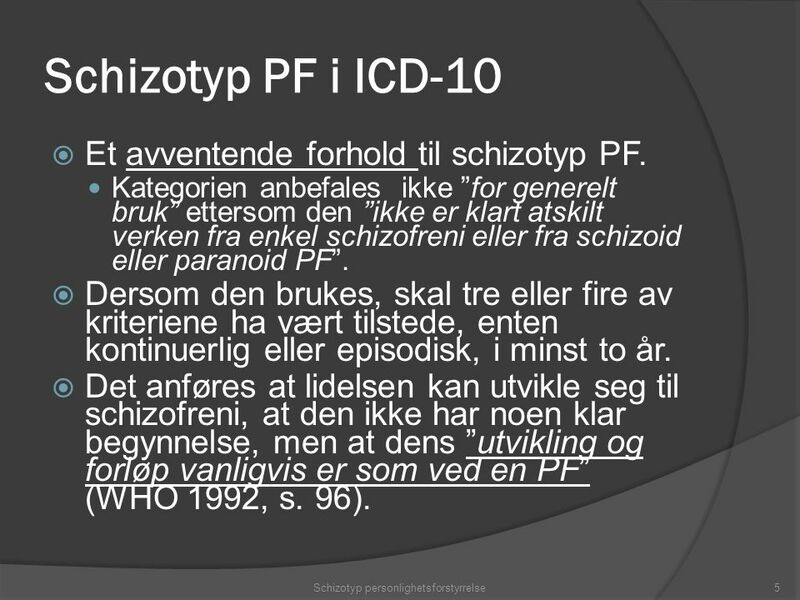 Eksentrisk: Odd, unusual, or bizarre behavior or appearance; saying unusual or inappropriate things. 3. 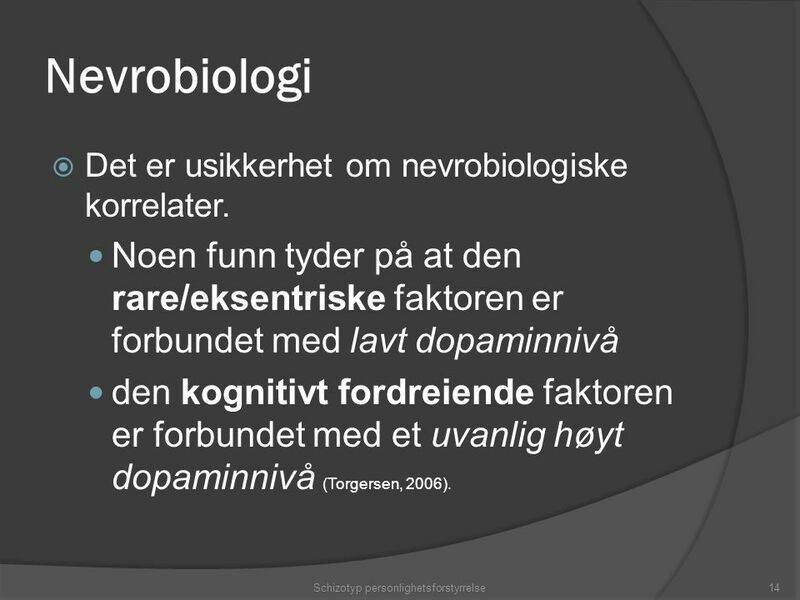 Kognitiv og perseptuell dysregulering: Odd or unusual thought processes; vague, circumstantial, metaphorical, over-elaborate, or stereotyped thought or speech; odd experiences in various sensory modalities. 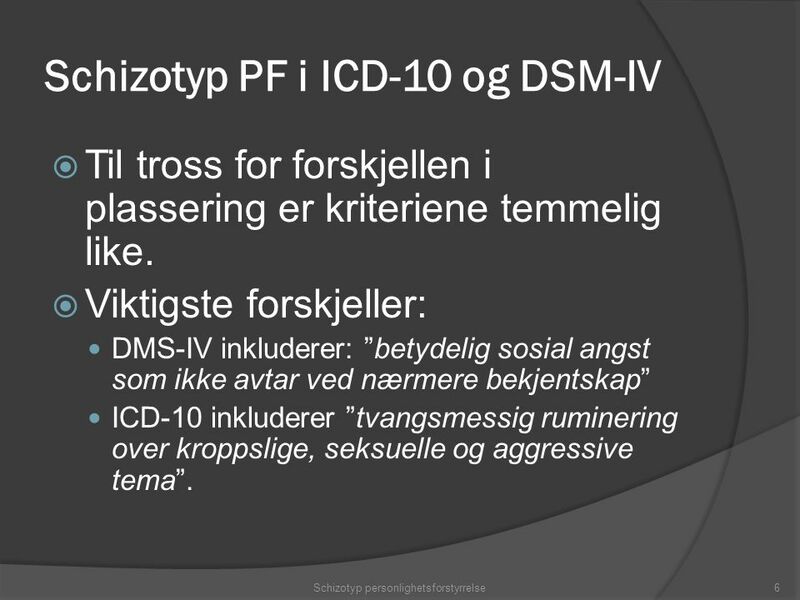 13 DSM-5: Fire eller flere av 6 patologiske personlighetstrekk Tilbaketrukkethet 1. 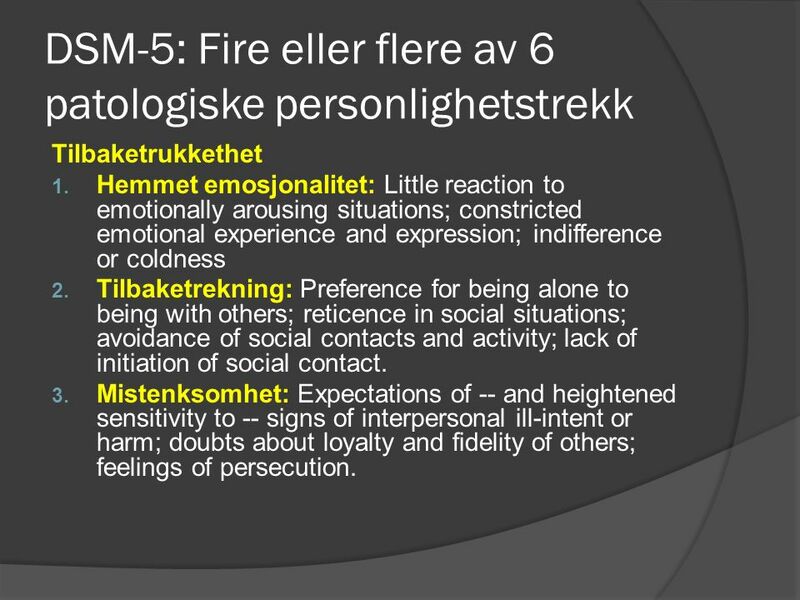 Hemmet emosjonalitet: Little reaction to emotionally arousing situations; constricted emotional experience and expression; indifference or coldness 2. 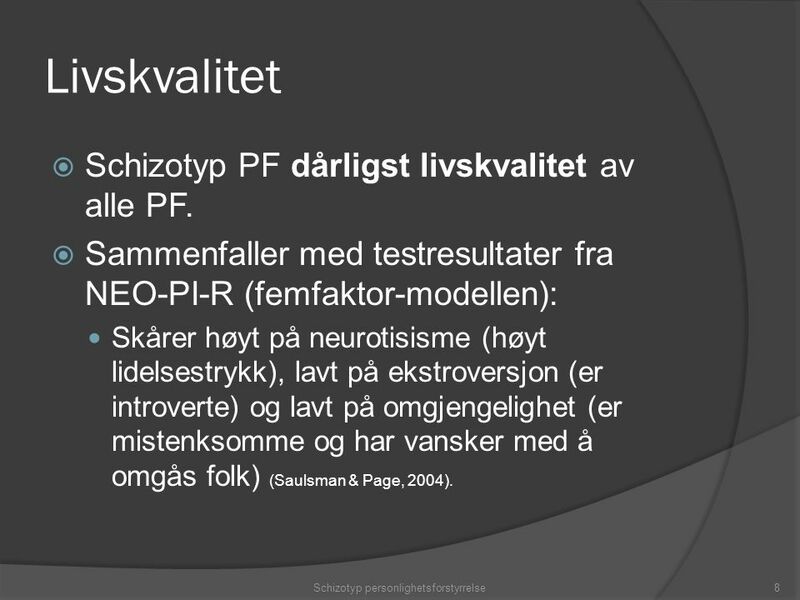 Tilbaketrekning: Preference for being alone to being with others; reticence in social situations; avoidance of social contacts and activity; lack of initiation of social contact. 3. 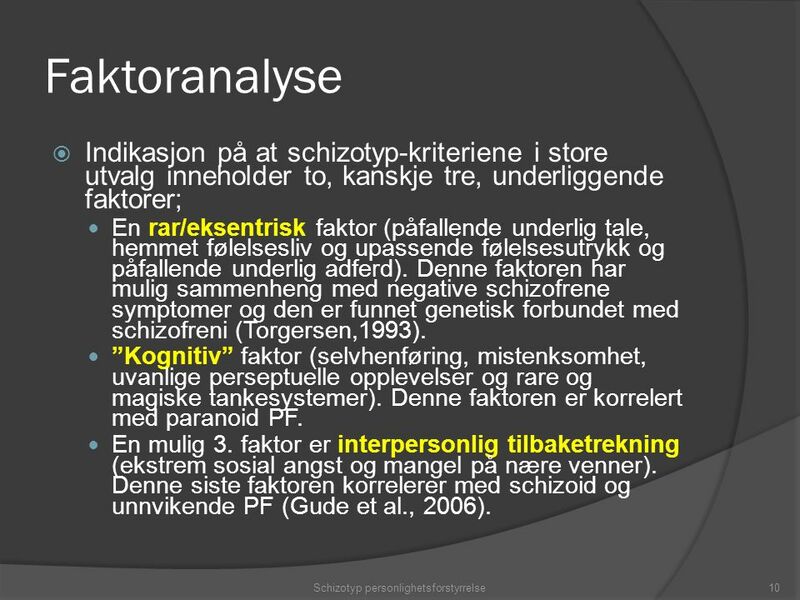 Mistenksomhet: Expectations of -- and heightened sensitivity to -- signs of interpersonal ill-intent or harm; doubts about loyalty and fidelity of others; feelings of persecution. 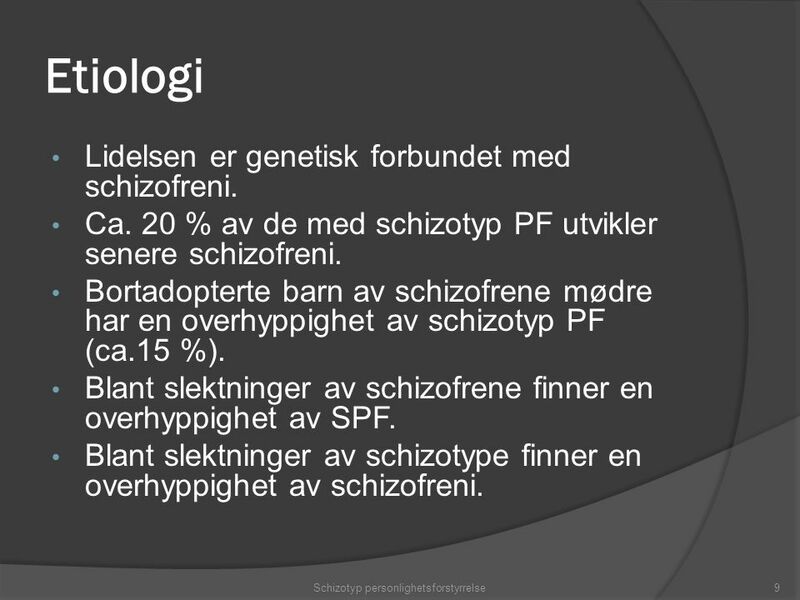 Laste ned ppt "Øyvind Urnes Avdeling for personlighetspsykiatri." 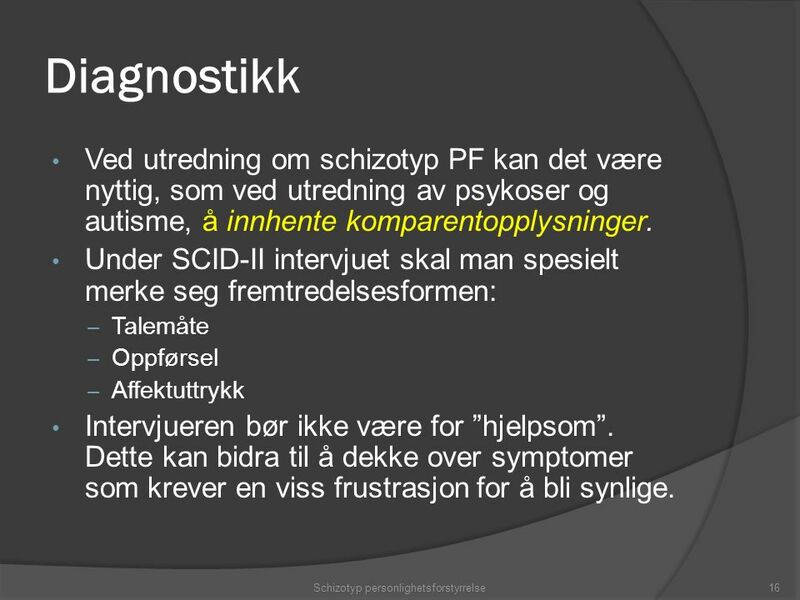 Utfordringer i utredning og behandling av ROP- lidelser: Fokus på rus og psykose Harald Aasen Seksjonsleder Ruspol Psykologspesialist Lovisenberg DPS. 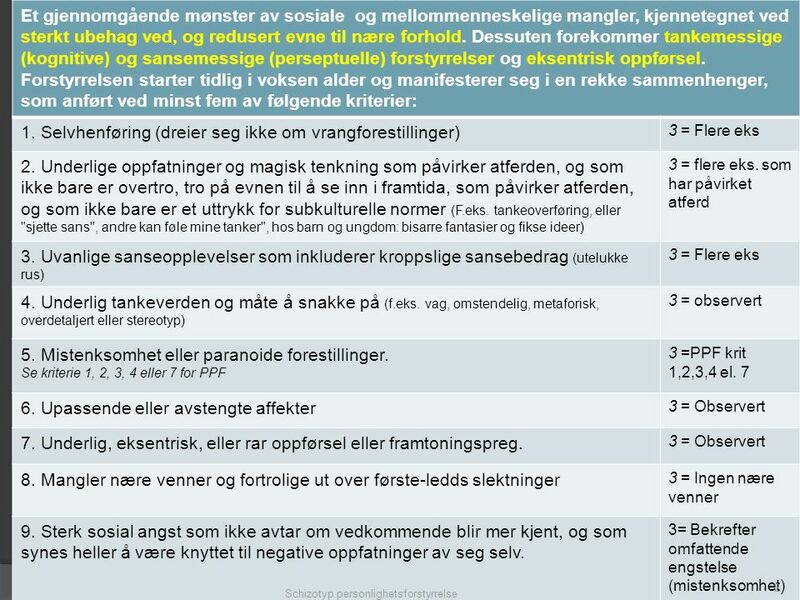 Øyvind Urnes, NAPP Utredning med Scid 2. 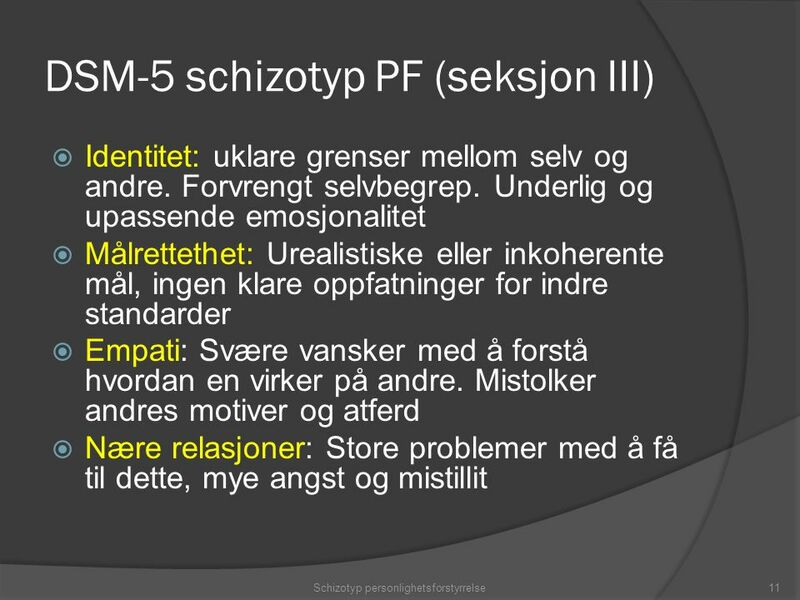 Tvangspreget PF  Et vedvarende mønster av orden, perfeksjonisme, mental og mellommenneskelig kontroll, på. 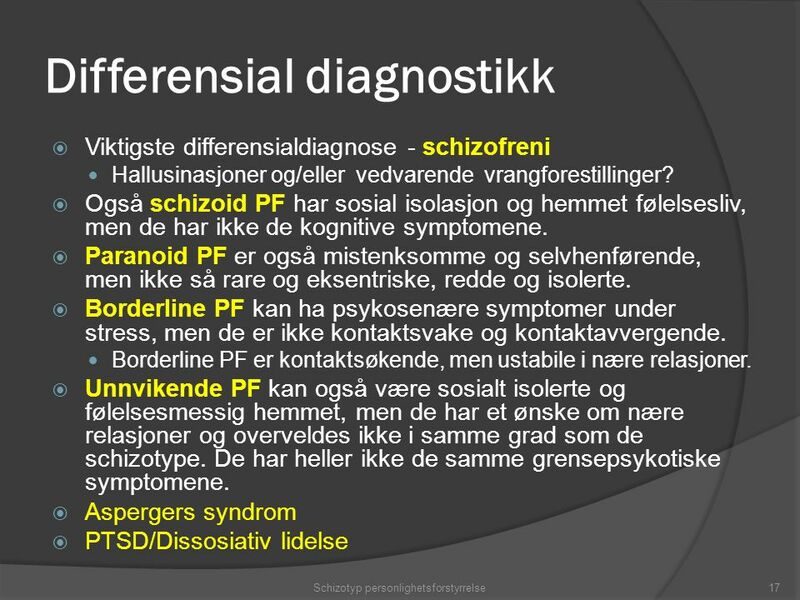 Schizoid personlighetsforstyrrelse (Cluster A: ”rare og eksentriske”) Øyvind Urnes Avd. 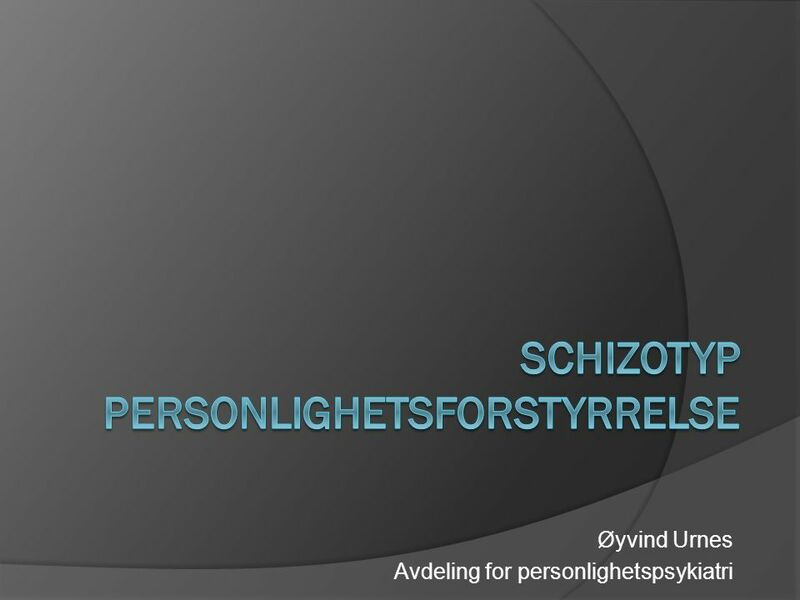 for personlighetspsykiatri Oslo universitetssykehus HF, Ullevål.